Two DN's. Shown is #452,Gougeon Design. 2001,Complete with reinforced Carbon "Rocket Mast" or Carbon/Glass,Aircraft Sitka Strip Mast. F01 Doyle Sail,Polish "T" Runners,$3000.00. Also Shown is #4148. 1999 Goodwin Design,F01 Sail,Winder Glass Mast,3/16 Stainless Inserts,$3500.00. Optional Equipment:Sarns Plates,$400.00,Stainless Angles ($200.00),Doyle Speed Sail,good condition,$300.00. Congratulations to all whose efforts made the 2013 Western Challenge an outstanding event. T has written a glowing report for the NewEngland website. Nicely done. However......Onalaska is in Wisconsin, not in Minnesota. No matter. Badger and Packer fans are always happy to help out Gopher and Viking fans, except on game day. Looking forward to seeing everyone at the Westerns and NAs. Congratulations to Mr Ron Sherry for a strong showing on Sunday in the light air. He came back to win the regatta and at the same time he had a great time getting his boys out on the ice for an epic father son weekend. Silver Fleet went to our man in Madison, Dave Elsmo! I'm sure his enthusiasm for iceboating, and his role as college sailing coach, has really ignited the college iceboating scene around the four lakes area. Thanks to everybody for coming together and getting the four races for each fleet in. They had to be run under tight time limits. Saturday we barely got the racing in before the sun went behind the bluffs. On Sunday we had to get started as early as possible as the wind was going light and the blizzard was fast approaching for the drive home. Thanks to everybody working as a team, we all had some nice racing. 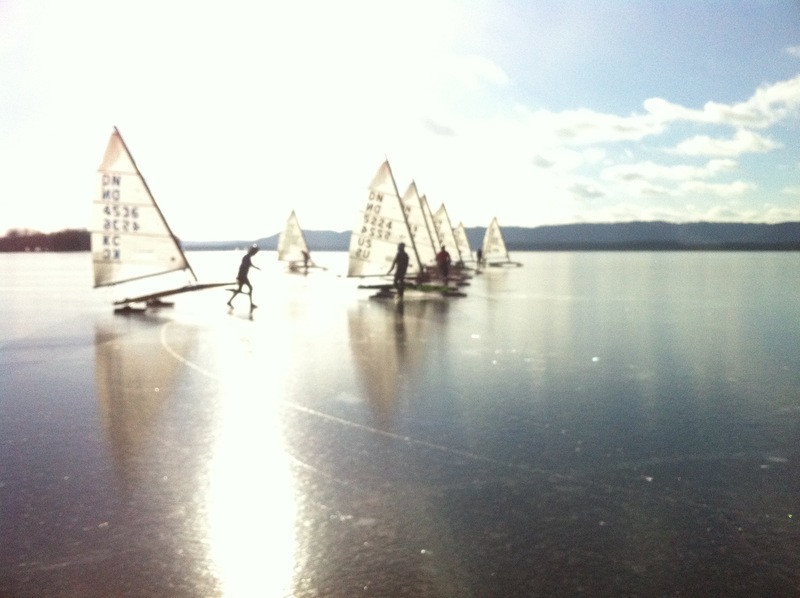 Everybody had a pretty good day catching up with their iceboating friends and aligning runners. We all had plenty of time to get all those little maintenance items on the boat done. Some participants were out on the ice at 8 am and got a few early morning puffs but everybody had to wait till after 3:00pm before we got in 2 Gold and 2 Silver races. Just when a couple of skippers took their sails down, the wind came on and the team sprung into action. We got the marks moved, starting line set in record time and started cracking off races. I added an image gallery for the regatta. We had shifty wind blowing around 8 to 12 mph. The ice was really hard and fast. It was really great to see all my friends from the all over the world. I'll bet the gang sailed two dozen races. I counted over 35 boats all lined up doing a scrub race! It's great to see this meeting of friends to enjoy what we love in an informal atmosphere. 3" of Black Ice on my Camp Lake. Pr. of excellent quality angles for this Spring's soft ice. Formerly owned by Todd Gamble and I will sell them for what I paid 8 yrs. ago. Call Mike Bloom @ six one two - five nine eight- three eight zero zero. Link to WCCO's written article and video: http://goo.gl/VFg3B. 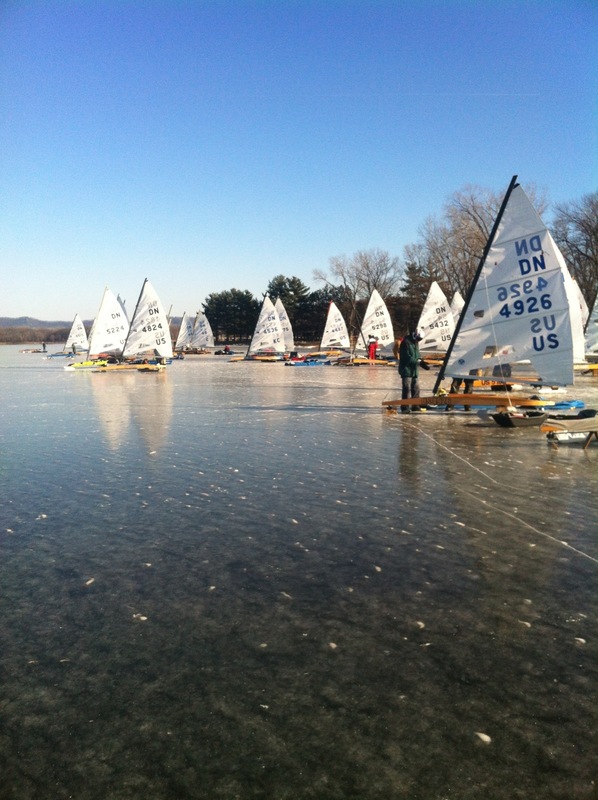 This is the first time in its 40 years that the DN Iceboating World Championship has ever come to Minnesota. At this championship people will race for the Gold Cup and then for the North American Championship. 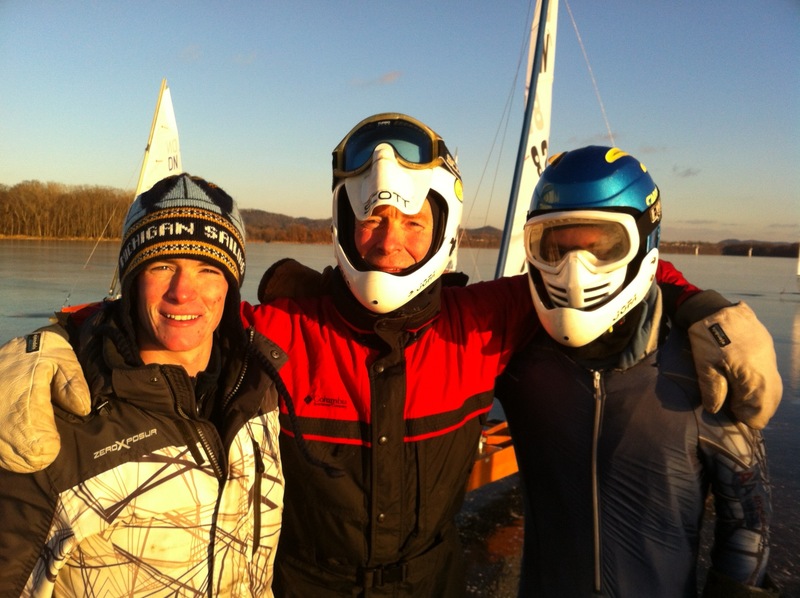 Re-started my old sailing blog,to keep track of my ice boating.